is honored on Panel 16E, Line 43 of the Vietnam Veterans Memorial. 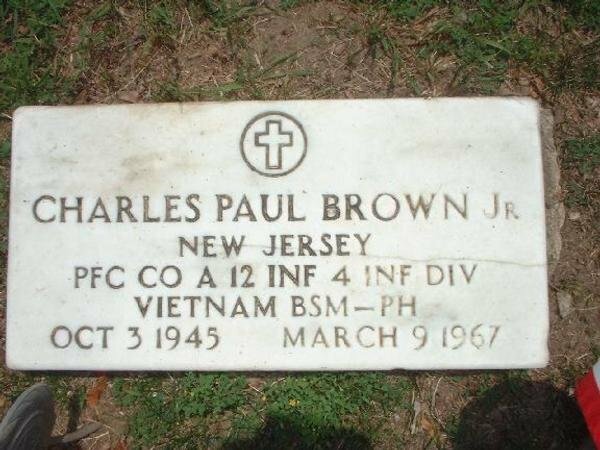 Private First Class Charles Paul Brown Jr., Served with Company A, 3rd Battalion, 12th Infantry Regiment, 4th Infantry Division. I hope you photo gets put here because this is a wall of faces and your is needed. Thank you for your service as an Infantryman. It is another summer, as time continues to pass since Vietnam. It is important for us all to acknowledge the sacrifices of those like you who answered our nation's call. Please watch over America, it stills needs your courage and faithfulness. Rest in peace with the angels. There is a correction on the place of burial for Charles. He is buried at New Calvary Cemetery, Parlin,NJ.